I am first and foremost a classically trained guitarist. I teach guitar full time and also perform in a duo with another classical guitarist. I teach in two different schools (three days at one and two days at another) and in the evening I teach at home in our annexe which has a waiting area for parents/family. I enjoy a wide range of musical styles and have great fun arranging all sorts of music (pop, rock, old new… ) for my guitar orchestras at school. Music is fun and should be enjoyed! I love what I do and hope that my lessons make the whole learning experience enjoyable. I like a lot of laughter and aim to adapt to each pupil's needs as they arise. It can sometimes be a long journey but it should be an experience to be enjoyed not forgotten and should ultimately end with a skill that can be carried through life at any stage of life. SueFrom Charles (5/5): Sue is not only a very talented musician, but also a great teacher. She has improved my playing enormously since week 1 and has been an inspirational influence. SueFrom Jenny (5/5): Very professional, lots of praise and attention for my five year old, we left and he said 'I like Sue… favourite part of my day'! Reply from: Sue: Thank you Jenny - it was my favourite part of the day too! 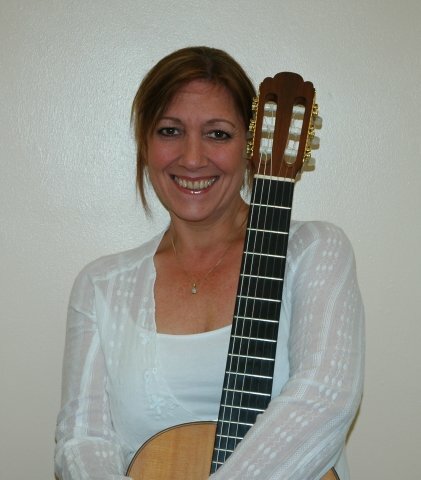 SueFrom Kenneth (5/5): What an excellent choice for classical guitar tuition. Although I am in my 60s and probably round about Grade 5 - 6 level, in just a few lessons Sue has already started to improve my playing ability, despite the years of 'hacking' my way through playing and picking up bad habits. I am very impressed at her ability to notice the slightest mistakes in my playing in addition to all the obvious mistakes and in helping me to overcome difficulties I have in some areas of playing. I thoroughly recommend Sue for classical guitar tuition. Reply from: Sue: Thanks Ken - you work so hard it makes my job easy! SueFrom Richard (5/5): Its one thing being a very skilled and accomplished musician (which Sue most definitely is) but its a completely different skill to be able to convey that knowledge over to others. She certainly has that too! An excellent tutor and highly recommended. I am so pleased I found you! I have learnt so much already after only 4 lessons! You have knowledge & experience in abundance which I am lucky to benefit from and you make lessons fun & enjoyable. Many thanks for everything so far! Reply from: Sue: You make it so easy Jayne! SueFrom Don (5/5): I first had guitar lessons with Sue over 20 years ago, when I started playing again on retirement it was some time before I found Sue was still teaching in my area and since resuming tuition with her I have to say without doubt she is the best! her enthiusiasm ,encouragement and sheer mastery of the guitar with which she demonstrates how the piece should be played is totally uplifting to those of us striving to improve ,I cannot reccommend her highly enough. Reply from: Sue: Praise indeed… Thanks Don!